Clarks protective vinyl boots are a must for any remote engineers utilizing audio snakes, camera cables, or any multicomponent cable used in the field. 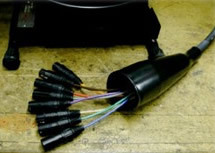 Prevents damage while rewinding cables after use, extending the life of the connectors. 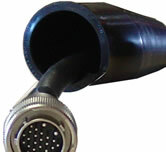 Available for any size cable up to .82 O.D.